Large-tailed Nightjar (Caprimulgus macrurus). Photo by Benjamin Lim. On 8 Jul 2017, 16 participants joined three Toddycats on a Love MacRitchie Walk along Venus Loop. While discussing the conservation issues surrounding the proposed Cross Island MRT Line, the keen-eyed participants kept a lookout for creatures along the forest trail. Even the most well-camouflaged animals revealed themselves! What seemed like a woody stump turned out to be a Large-tailed Nightjar (Caprimulgus macrurus) trying to take a snooze! There was also a really hairy caterpillar that seemed to blend into the tree trunk if you looked at it from the top. In the tree canopy, we would not have spotted the Blue-crowned Hanging Parrot (Psittinus cyanurus) if it had not been dropping starfruit bits as it feasted. It looked so much like a leaf! Caterpillar. Photo by Amanda Lek. Blue-rumped Parrot (Psittunus cyanurus). Photo by Benjamin Lim. 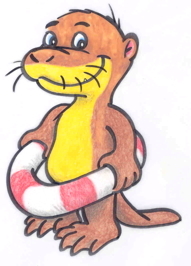 There were also some brilliantly coloured creatures that never fail to catch our eyes. Before we even hit the trail, a Scarlet-backed Flowerpecker (Dicaeum cruentatum) was gorging on a breakfast of Senduduk (Melastoma malabathricum) fruits. It must have been so hungry because it didn’t mind all the people standing barely a metre or two away, snapping away with their smartphones! Nearby, a beautiful turquoise coloured Common Bluebottle (Graphium sarpedon) was sipping nectar from the Red Leea (Leea rubra). Scarlet-backed Flowerpecker (Dicaeum cruentatum). Photo by Amanda Lek. Common Bluebottle (Graphium sarpedon). Photo by Joyce Wong. Wild boar advisory by NParks. Photo by Chloe Tan. The little ones who joined the walk had lots of fun trudging along the dirt trail and letting their imagination run wild! Waiting to be teleported to another realm. Photo by Chloe Tan. Everybody learned new things on this fun-filled walk. We shared our passion for nature in different ways, be it through photography, nature education or simply loving the great outdoors. 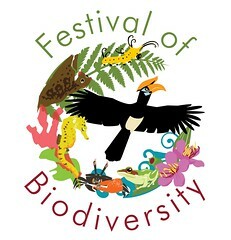 Let us do what we can to help conserve Singapore’s Nature Reserves for the generations to come! Group 1 with their guide, Amanda Lek (front row, first from left). Photo by Amanda Lek. Group 2 with their guide, Claire Jonquieres (second from left). Photo by Joyce Wong. Group 3 with their guide, Chloe Tan (back row, right). Photo by Chloe Tan. 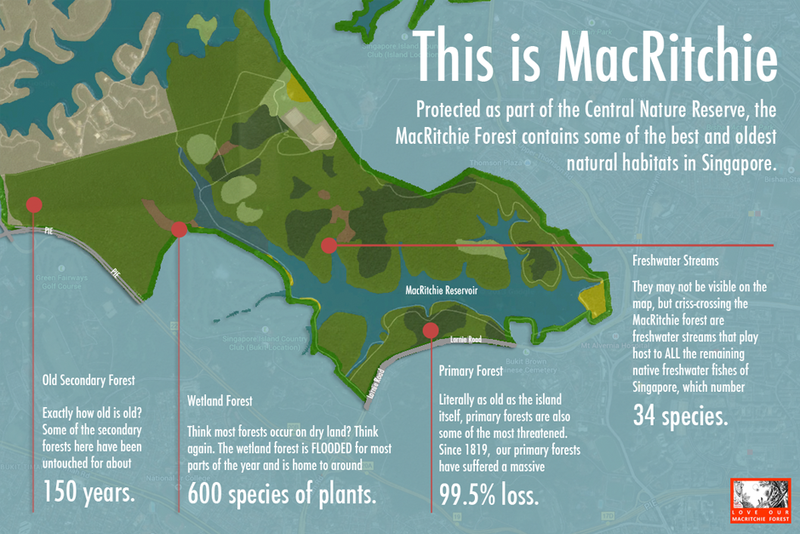 Find out more about the Love MacRitchie movement here. See more photos of the walk on Facebook. A pleasant walk through the shady forest. Photo by Jensen Seah. It had been a week of scorching hot weather so a walk through the shady forest was a much welcomed respite from the urban heat. Three Toddycats and 18 participants turned up at Venus Loop on 11 Jun 2017 to observe the wildlife in MacRitchie Forest and discuss the conservation issues surrounding the proposed Cross Island MRT Line. The animals in the forest were going about their usual activities and we got to observe them really up close! There was a jumping spider was hopping around a plant, probably hunting for its breakfast. We got to see its huge pair of forward-facing eyes that helps it judge distance better so it can accurately pounce on its prey. A Common Flashwing damselfly (Vestalis amethystina) was basking on a sunny spot at our eye level, its purple wings shimmering beautifully. One group also spotted a headless Golden-spotted Tiger Beetle (Cicindela aurulenta)! We wonder who the gruesome predator was. Jumping spider. Photo by Jensen Seah. Common Flashwing (V. amethystina). Photo by Jensen Seah. Golden-spotted Tiger Beetle (C. aurulenta). Photo by Joleen Chan. The birds also came out to play. A Dark-necked Tailorbird (Orthotomus atrogularis) came unusually close to the trail, prancing about the foliage. There was a Greater-racket Tailed Drongo (Dicrurus paradiseus) that was singing at the top of its funky metallic voice too! Dark-necked Tailorbird (O. atrogularis). Photo by Jensen Seah. Greater Racket-tailed Drongo (D. paradiseus). Photo by Chloe Tan. Some of us saw a leaf-like object glide across the trail and perch on a dead tree trunk. Upon a closer look, it turned out to be a Black-bearded Gliding Lizard (Draco melanopogon)! A handsome male was showing off its black throat flap, possibly in an attempt to get the attention of a female that was on the same trunk. Nearby, a Plantain Squirrel (Callosciurus notatus) was very busy collecting nesting materials. Black-bearded Gliding Lizard (D. melanopogon). Photo by Chloe Tan. Plantain Squirrel (C. notatus). Photo by Chloe Tan. Tak Wei from BES Drongos does some sharing. Photo by Joleen Chan. On this walk, we felt with our own skin the profound importance of forests in climate regulation. Our biggest lesson of the day was that we depend on the forests of our Nature Reserves as much as the animals do! A big thank you to the guides and participants for the lovely morning adventure! Group 1 with their guide, Joleen (on right). Photo by Joleen Chan. Group 2 with their guide, Claire (on right). Photo by Claire Jonquieres. Group 3 with their guide, Chloe (third from right). Photo by Chloe Tan. Find out more about the Love MacRitchie movement here. See more photos of the walk on Facebook or Flickr. Be sure not to miss Pesta Ubin – Pulau Ubin’s Open House, 10 May – 16 July 2017! Pulau Ubin is going to be abuzz from 20 May to 16 July 2017! 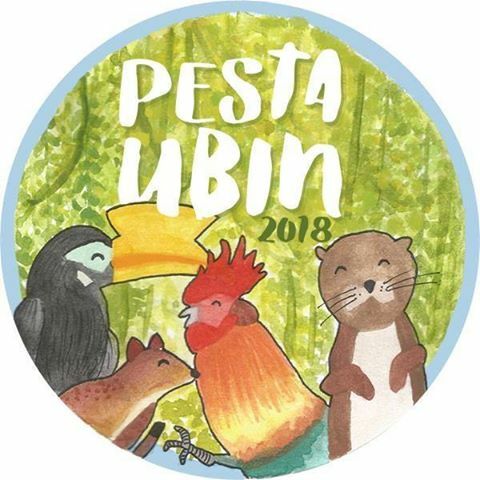 Volunteers from some 20 organising nature and heritage groups have come together to offer a slew of Pesta Ubin activities. 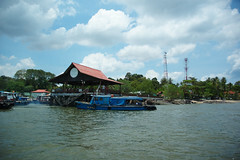 Many Pesta Ubin activities are offered free of charge to members of the public. You may not even need to register for some – just join in the fun once you are on Pulau Ubin! Check the blog to see what is happing by date and activity type – something is going on EVERY weekend during this period. NUS Toddycats are supporting the Balik Chek Jawa event and a Pedal Ubin ride for sure! Just some of the people behind Pesta Ubin! Erin showing how to make a windmill using rubber fruit capsules. Photo by Lily Leong. Toddycats volunteers had a great time guiding members of the public during the Love MacRitchie Walk that was held on 9 Apr 2017. This walk was unusually exciting because we saw many uncommon birds! A film crew from Mediacorp Channel 8 also joined us to shoot a feature on volunteerism in Singapore. Aside from the usual suspects such as the fungi, figs, dragonflies and spiders, we were especially excited to see some pretty rare birds such as the Siberian blue robin (Larvivora cyane), blue-rumped parrots (Psittinus cyanurus), and chestnut-bellied malkoha (Phaenicophaeus sumatranus). The Siberian blue robin is an uncommon winter visitor in Singapore while the rare blue-rumped parrot and uncommon chestnut-bellied malkoha are forest-dependent residents. Blue-rumped parrot feeding on starfruit seeds. Photo by Jensen Seah. Chestnut-bellied Malkoha. Photo by Chloe Tan. The film crew from Channel 8 interviewed the volunteers to find out why it is important to protect the Central Catchment Nature Reserve and what drives our passion to help conserve Singapore’s wildlife. Our friend, Teresa Guttensohn from Cicada Tree Eco-Place also joined us to share her story. The crew also interviewed the participants who shared their experience in the forest as well as what they saw and learned. Chloe being interviewed. Photo by Teresa Guttensohn. Alvin being interviewed. Photo by Joleen Chan. A family of participants being interviewed. Photo by Joleen Chan. Teresa from Cicada Tree Eco-Place sharing her story. Photo by Chloe Tan. Catch the Morning Express episode featuring Love MacRitchie on 2 May 2017, 9 am on Channel 8! See more photos of the walk on Facebook or Flickr. 16 Feb 2017 – NUS Toddycats joined forces with the BES Drongos and Campus Creatures for the first time to take part in the Biodiversity Roadshow organised by NUS’ Office of Environmental Sustainability at the Forum. We showcased wildlife commonly found within the leafy Kent Ridge campus, and by extension, in wild spaces around Singapore. We had at our booth preserved specimens of commonly encountered snakes in NUS, a plantain squirrel, a palm civet, a specially curated insect box from the Lee Kong Chian Museum accompanied with blown up posters of other campus creatures found in campus. A popular display with curious students and staff, they were given advice about what to do during snake encounters (most of all, don’t hurt the snake! ), how to best enjoy the natural history museum on campus (free for all NUS staff and students), and learn about the wildlife that still survives urban Singapore. We thank NUS OES for hosting us at the roadshow – it was fun! For more pictures from the event, see our flickr album. Shelters as well as their occupants deserve a good scrub down, so my former students have banded together to start “The Shelter Pawject”. These Toddycats and doggie owners Joys & Grace Tan, Ong Say Lin and Amanda Tan know the need for consistent and thorough work, so have arranged to spring-clean shelters four times a year. Besides that tough work, there will be the joyous activity of bathing, walking and feeding dogs too. If you are ready to sweat it out, get wet and dirty, and are comfortable around dogs, both big and small, the first scrubdown is at Uncle Khoe’s K9 shelter on Sun 19 Feb, 1.00pm – 4.00pm. There are 20 places, and for details and registration, visit their Facebook page.